"The course narrowed down what I wanted to do and set me up for my job." 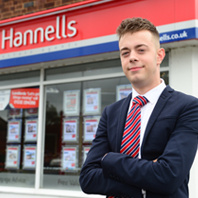 As part of Derby College’s Employer Academy he did work experience at Hannells Estate Agents. That directly led him to get a foot on the property career ladder. When a position came up, Aaron was taken on and he is now a sales negotiator and a valued member of the team. Derby College’s Employer Academy programme aims to boost students’ employability skills and job prospects as well as giving employers the opportunity to shape the college curriculum.